Rain scald tends to occur on a horse or pony over the winter months when the weather is very wet . Like mud fever, rain scald is a common problem in winter for horses. It is sometimes referred to as equine dermatophilosis, a name derived from the main type of bacteria that cause rain scald on horses and ponies. Occasionally different types of bacteria such as Staphylococci can also play a part in causing Rain Rot on a horse. The signs and symptoms of rain scald on a horse or pony are easy to spot - the coat and skin look as though the skin has been scalded with droplets of water. This rain scaldeffect is caused by the horse's skin exuding a sticky secretion which sticks the hairs of the horse's coat together. Eventually scabs form which are usually small, but can be up to 2cm in diameter or sometimes even bigger. Although not itchy the scabby areas of rain scald are painful to touch. If the scabs are removed the area underneath will be sore and may bleed a little. The use of Graphites is indicated where the skin lesions of the rain scald are very sticky or weeping. Mezerium benefits conditions where there are thick scabs. Rhus tox is of greatest benefit where the horse's skin is very inflamed. 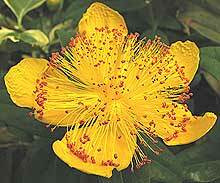 Give hypericum, also known as St John's Wort, 1 to 3 times a day for 3 to 4 days until the symptoms start to abate. A tincture of Calendula sprayed on the sore areas can be very effective.